AVI stands for Audio Video Interleave and is defined by Microsoft. AVI is the most common format for audio/video data on the PC. While, Mac users may also have the need to convert DVD to AVI format. Below is the step by step guide to show you how to convert video DVDs to AVI movie on a Mac computer. This Mac DVD Converter is a all-in-one DVD Converter that can convert DVD to nearly all mainstream video and audio formats. We just need to choose the AVI format we need. Make sure you have downloaded and installed the DVD Converter on your Mac. Then, let's start the conversion. As we can see in the picture, the DVD Converter can also convert DVD folder and ISO files. 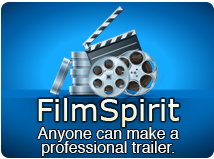 According to your needs, select the AVI - Audio-Video-Interleaved(*.avi) profile in "Common Video" classification in the "Profile" drop-down list. 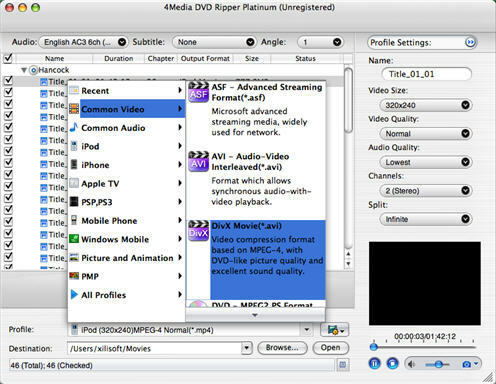 The DVD to AVI Converter allows you to change the default DVD audio, subtitle, and angle for output files. Furthermore, you can set output video size, video quality, and channels in right profile setting panel. Click "Convert" button on the toolbar to start the DVD to AVI conversion. In a few minutes, you will see the conversion has been finished. After conversion, just click the "Open" button to check the target AVI file conveniently. Try 4Media DVD to Video for Mac for free.